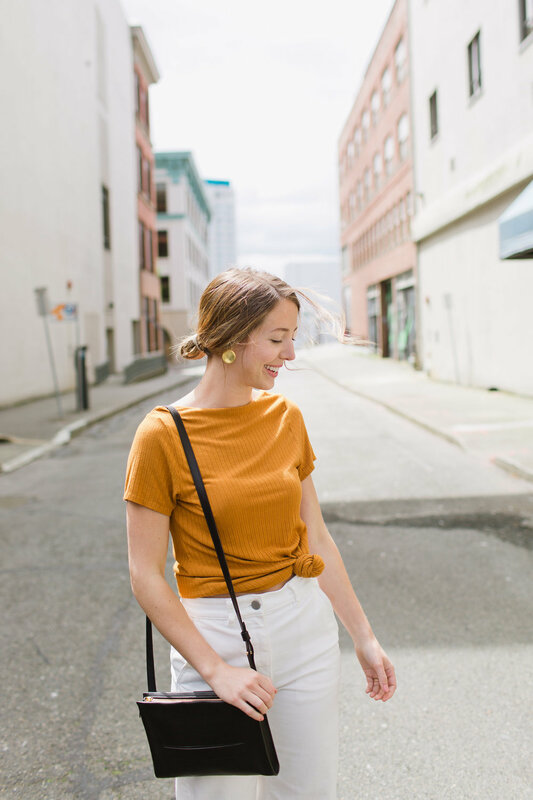 Emily’s authenticity and joyful spirit shine through the blog and Instagram account, A Day Pack, she runs with her husband Nick. I was instantly enamored and upon realizing we were both based in Seattle, I knew I needed to meet her. Some shared pizza and wine later, she truly became a muse. Emily’s commitment to living simply and with a pure, open heart is inspiring and embodies much of what we hope is translated through Vele. I have learned from her and hope her words touch you too. How Has a Friend encouraged you lately? I was recently presented with a situation at work where I needed to stand up for myself. After doing so, I honestly didn’t see the situation as novel or grand. In my opinion, it was what needed to be said in the moment. When I shared this with a dear friend of mine, she immediately sat back, flashed a huge smile with a splash of surprise, and proceeded to completely affirm the words I had spoken and build me up. She told me she was exceptionally proud of me and expressed how bold and courageous I was for speaking the truth. What stood out to me about her encouragement was how she took a situation I wouldn’t have regarded in any way as heroic and helped me see how I had accomplished something brave. She took a situation that felt normal, even uneventful, and drew out bravery out from it. True friends call out the simple good in us that we’re often blind to. What would you share with a friend who's struggling to know her self worth? I would encourage that friend to take a little break from social media and spend time, in person, with good people who love them. The times I’ve felt most insecure were when I was most distant from community. We were not meant to do life alone and good friendships and relationships are a gift. They speak out our strengths, remind us of what matters, and provide a safe space to dream bigger. When I hear the statement “you are worthy and wanted,” I immediately think of my identity in Christ. It’s honestly taken me into my late twenties to realize just how whole, unique, strong, and worthy of love I am. When I look back on my life, I sadly feel as though I spent a good portion of 16-25 searching: searching for love, searching for acceptance, searching for identity. I ultimately found myself searching for joy in jobs and relationships and my appearance and things. I regularly came up empty handed and discouraged, feeling like everyone else around me knew who they were, knew what they were doing with their lives, and ultimately, knew they were loved. How was I still floundering, all while striving to cover up my insecurities and fears? God is rad and His patience baffles me. Because my identity is rooted in my relationship with God and who He says I am, I no longer flounder. I don’t just feel that I am worthy and wanted, I know it. When I put my identity in my job, my accomplishments, my relationships, my appearance, or the things I own, I will never be satisfied. Why? Because all of these things will fail me. When my view of who I am is seen through the lens of how God sees me, I finally understand why I am worthy and wanted. I feel most empowered when I have the opportunity to be creative. Whether that be music, photography, sewing, or designing content for our blog, I always feel a jolt of energy, joy, and strength when I create. Any favorite quotes when you need a little boost? I know at first glance, this quote may not seem like one of those little pick-me-ups, beautifully hand-lettered wordings we often save on Pinterest. This quote is a little more raw, a little more real, but it’s truth. When I first read this quote in The Kinfolk Entrepreneur, I honestly felt relief. We live in an age where we regularly “put our best foot forward.” Social Media is just this: a photo reel of our good days. This is not to say that Instagram, or Facebook, or Pinterest are bad; we just need to be mindful when comparing our lives with what we are allowed to see in others lives. When we compare our worst to another’s best, we are establishing a false standard for how to live. Our own unique stories will never flourish when we are busy running after someone else’s.